Corn Agronomy: Do farmer acreage intentions predict actual planted acres? Last Thursday USDA-NASS came out with crop plating intentions for the U.S. This report along with the ending stocks report dramatically influences markets. Last week was no exception with market prices decreasing with the news that 2016 corn acreage intentions were up 6% and soybean acreage intentions were down 1% from 2015 planted acres. Nationally, ending stocks were up 1% for corn and up 15% for soybean. The acreage intentions report can influence the crop rotation decision for a field, especially for corn. I was curious as to how well the acreage intentions report reflected actual planted acres, so I collected data back to 1975 for every state that produces corn and compared acreage intentions with planted acres for the year. The results are shown in Figure 1. Figure 1. Spring Acreage Intentions, Planted Acreage and the Relative difference (%) for Corn and Soybean in the US and WI. With the exception of 1983 and to some extent, 1993 and 1995, acreage intentions have accurately predicted planted acres within 5%. There are as many years over-predicted as under-predicted. For the 40-year period, there was a 3% standard deviation between intended and planted acres for corn and soybeans. 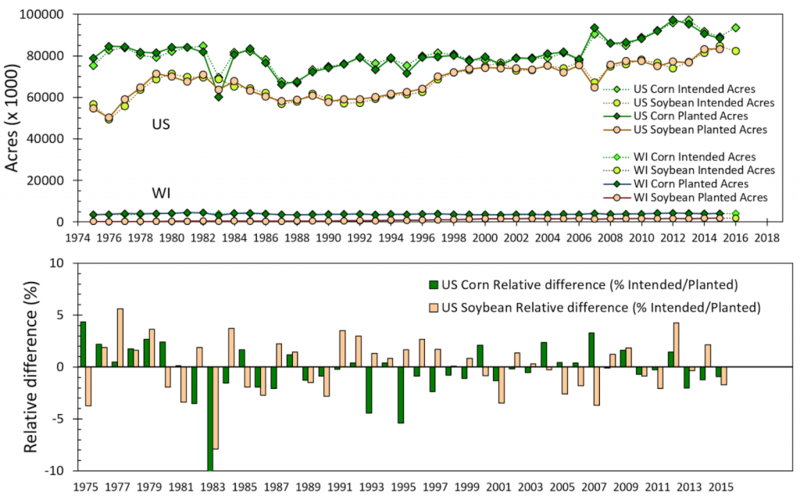 In WI, which is typical of northern Corn Belt states, there was wider standard deviation (corn = 5%, while soybean= 11%) indicating weather impacts on acreage decisions as the planting season progresses.